Tour Announcement: Grammy Nominees Bring Me The Horizon Announce Second Base Tour Reviewed by Dianna Augustine on February 26, 2019 . This is the first show announced since lead vocalist Oli Sykes ruptured his right vocal chord leading the band to have to cancel a small portion to the end of their last run. The tour kicks off May 5 in Jacksonville, Florida at the Welcome to Rockville festival and concludes two weeks later at Sonic Temple in Columbus, Ohio. See all of the stops and tour info listed in the press release below. After a week that saw BRING ME THE HORIZON hit No. 1 on both sides of the pond with new album amo (including their first-ever chart-topper in the UK and No. 1 on Billboard’s Hard Music Album Chart), perform on Jimmy Kimmel Live! and headline The Forum in Los Angeles, the Grammy nominated British rock band has announced their spring Second Base Tour. The tour, which follows the band’s North American First Love headline run, includes eleven headline shows and multiple festival appearances (see itinerary below). 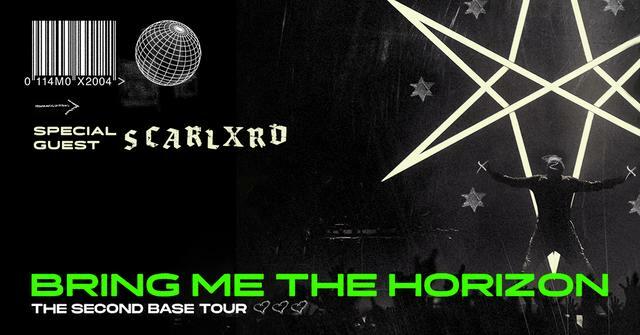 Special guest SCARLXRD will join all dates. The Second Base Tour will kick off May 8th in Milwaukee, WI and make stops in Philadelphia, Toronto and more before wrapping May 18th in Grand Rapids, MI. Citi is the official presale credit card for the tour. As such, Citi cardmembers will have access to purchase presale tickets for the newly announced dates beginning Wednesday, February 27th at 10:00 a.m. local time until Thursday, February 28th at 10:00 p.m. local time through Citi’s Private Pass program. For complete presale details visit www.citiprivatepass.com. Tickets will go on sale to the general public beginning Friday, March 1stat 10:00am local time at LiveNation.com. Bring Me The Horizonare one of the most electrifying and successful rock bands to emerge from the UK, selling over 4 million albums globally to date, playing sold-out shows in over 40 countries, including two sold out nights at London’s O2 plus wowing a traditionally non-rock crowd at Glastonbury Festival in 2016. They just completed a sold-out UK tour in November and you can see them performing “wonderful life” to a packed-house arena crowd.